Hookahsticks is here to help you, whether your trying to quit smoking, are a casual smoking, or just looking for a new alternative to smoking, it's the perfect choice for a healthier and safer way to smoke. You can take Hookahsticks virtually anywhere because it's just vapor. We want you as a customer to take our hookahsticks everywhere and start a green revolution. Smoking cigarettes does so much harm to your body while hookahsticks contain zero nicotine, zero tar, zero tobacco and zero carcinogens. It's time to start living a better and healthier life. Try a hookahstick today! 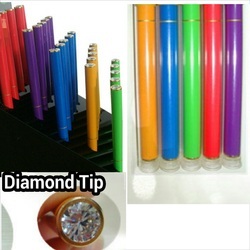 DIAMOND TIP INTERCHANGEABLE HOOKAHSTICKS ARE HERE! "KEEP THE STICK, CHANGE THE CARTRIDGE"
We are PAYPAL verified and accepted. Please make sure your PAYPAL address is updated and correct before placing an order. 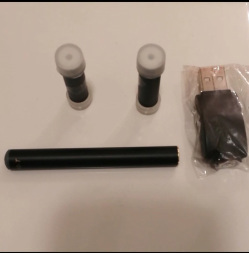 For More information about the hookahsticks click on the top right hand corner. NEW FLAVORS AND MORE TO COME! STRAWBERRY, BLUEBERRY, MANGO, RED BULL, MINT, CHERRY, WATERMELON, PEACH, GRAPE AND MIXED FRUIT. CLICK BELOW ON VISIT MY STORE TO ORDER.